No, never did I ever think I would be typing “lactation” and “cookies” in the same sentence and especially not on my blog. Here is my take on lactation cookies: I don’t know if the COOKIES really work, but I do believe that the key ingredients (oats, brewers yeast, coconut oil, flax) work. I sort of think that the cookies are an excuse to… eat cookies? But in a good way! Also, this is why I think they are so great – in those first few weeks, and heck, even now, I was so freaking hungry, like had never been so hungry in my life. Having something quick to grab, like something even quicker than a banana and almond butter, was imperative while in survival mode. Especially in the middle of the night. Even since having Max, I’ve developed this hangry hunger every morning, to a point where if I don’t eat something very soon after waking, I feel physically sick. Most likely because he is taking calories from me at night? I’ve never dealt with that before. So having one of these as a snack in the middle of the night or even right when I wake up is a complete LIFESAVER. Now, these are cookies. Like actual taste-good cookies. I tried a few recipes in the last couple weeks that tasted like cardboard and were drier than dirt. I wanted to make actual enjoyable cookies, ones I wanted to eat, ones I’d be happy to grab twice a day, maybe three times. The texture: These are thick cookies, not cakey at all, slightly crunchy, but not in a bad or stale way – they are crunchy from the crazy amount of rolled oats inside. I wrote the recipe exactly as I’ve been making them – meaning mostly organic ingredients. Feel free to use non-organic ingredients and what you have on hand. If you want to gift these to a new mom, I would make a batch and bake them, then make a batch and freeze them. Or bake half a batch and freeze the other half. Deliver both. Making a freshly baked double batch isn’t great because the cookies aren’t super soft and moist and that number of cookies will dry out before eaten. Unless of course their family will eat them too. If you’re a mom-to-be, you can totally make these ahead of time – scoop the dough into rounds, flash freeze it then place them in a ziplock bag. My friend Julie has a great tutorial on freezing cookie dough! 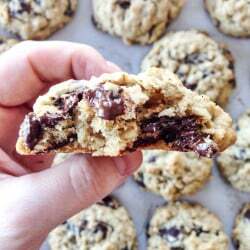 Do you have an awesome lactation cookie recipe? If so, share below! In the bowl of your electric mixer, beat the butter and coconut oil on medium speed until creamy. Add in the sugar and beat on medium to high speed until fluffy, about 4 to 5 minutes, scraping down the sides of the bowl if needed. Add in the egg and egg yolk, beating until combined, about 2 to 3 minutes. Add in the vanilla extract and beat until combined again. Gradually add in the dry ingredients, beating on low speed until just combined and mixed. Stir in the chocolate chips with a spatula until they are evenly dispersed. Scoop the dough into 1-inch rounds (I use an ice cream scoop so they are fairly uniform in size) and place on a baking sheet about 2 inches apart. Bake for 10 to 14 minutes, or until the bottoms are just golden. Let cool completely before storing in a sealed container. 1. You can easily freeze this dough – scoop the rounds on a baking sheet, place the sheet in the freezer for 2 hours, then place the dough rounds in a ziplock bag and store in the freezer. Bake at the same temp – they may or may not need an extra minute or 2 – your preference! 2. You can use all butter if you don’t have/can’t find coconut oil. If you swap any butter amount for more coconut oil, the cookies will spread a bit more. If you decrease the fat (butter/oil) amount in total, these cookies will be drier. It’s up to you! 3. You can use 1/2 cup of whole wheat flour with similar results – any more and the cookies with be drier and grittier. 4. You can probably decrease the sugar by 1/4 cup without issue. 5. I do not have experience in making these vegan, so I can’t say what it would be like without the eggs or with vegan butter. I also am not sure how the consistency would be with gluten free flour. 6. I personally think you can increase the brewers yeast amount by 1 to 2 tablespoons. BBQ Meatloaf and Grilled Fontina Cornbread Stacks. I have not yet made the cookies but want to know does everything have to be organic? I have most ingredients in my cabinet but not organic except my coconut oil! Please help this new mama out! No, I’ve made these a ton of times and the only thing I use organic is the sugar. I’m kinda low on my supply and need to increase milk flow. These cookies are kind of addicting which has me hestitant on making them as I’ve lost most all of my baby weight 6lbs to go. You’ll certainly enjoy them and your prodction will increase significantly. What brand of flax seed did you guys use? There’s way too many to choose from so I just want you know what you guys used since you’ve already made it. I definitely want to give this recipe a go. My baby is allergic to dairy (cows milk). Any suggestions for substituting the butter? Also, what is a good brand for brewers yeast? My baby also doesn’t tolerate dairy and for most calling recipes you can sub coconut oil for butter. However, that can sometimes made it a bit drier/crunchier. I made this recipe with all coconut oil (what was already listed plus substitute for butter) and they were too dry and crumbly. Next time I will try adding back in half of the egg white that is left out as that will affect more moisture and may do a tap of water. I really want to thank you for this recipe, it is amazing. I was really skeptical, I’m no fan of oatmeal cookies and the brewers yeast smells weird but my midwives recommended I try them. My first batch was a huge success! The texture is great, the flavor is great. they’re healthy but not a chore to eat. this batch was almond joy flavored with coconut and almond. I’m going to try walnut and cranberry for the next batch. I’m freezing them ahead for later so I’ll see how they “work” but regardless, they are delicious! Can I used coconut sugar instead of cane sugar? I do-,and it’s great! I actually use a Brewers yeast that’s made from molasses & I use 1 c. Coconut Sugar & ½ cup molasses – it works great with the brewers yeast! I want to use whole wheat flour. The suggestion says use 1/2 cup whole wheat flour is ok. Does that mean I only use 1/2cup flour for the whole recipe then? Or does that mean I use 1 cup regular flour and 1/2cup whole wheat? only use 1/2 cup of the wheat flour in the whole flour measurement, so use 1 cup all purpose and 1/2 cup whole wheat! if you use all whole wheat flour, they will be super dry and gritty! These are really yummy! I added some coconut and found the dough to be dry: when I went to mix the chocolate chips in they really didn’t incorporate into the dough, basically all falling to the bottom of the bowl. I would suggest either mixing the chocolate chips into the dry ingredients before mixing wet and dry together, or to add them in before mixing the last of the dry ingredients into the wet. Such a yummy recipe and my toddlers approve! Went to make these again and realized I used whole wheat flour instead of all-purpose 🤦🏻‍♀️ That’s probably why my dough was dry! 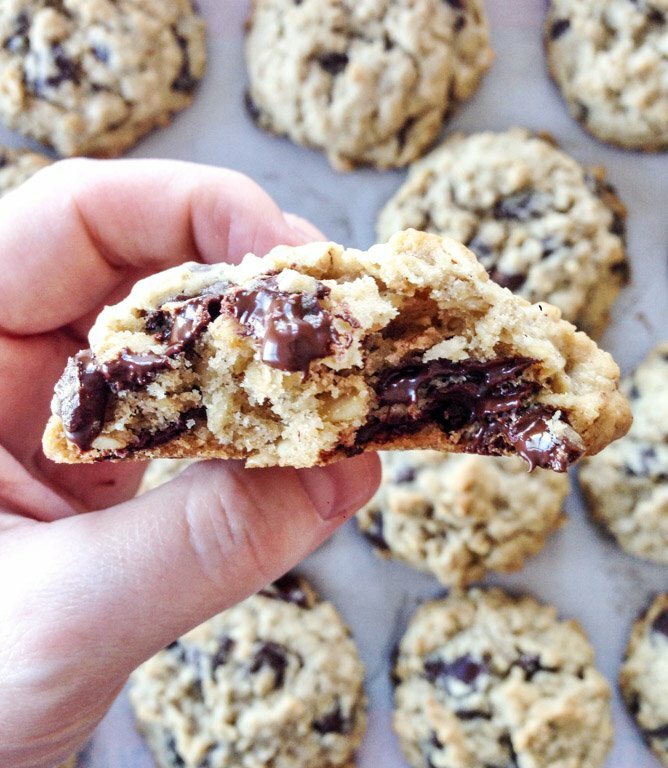 I recently made these cookies following the exact recipe but adding in about a cup of Nutella hazelnut chocolate. These cookies turned out great and made the house smell amazing! The only set back I had was that the cookies didn’t spread much and kept most of it’s ball shaped form. They also broke pretty easy while eating them. Other than that, delicious and not too dry. Definately going to be giving this recipe a try. How long do they last after baking ? Can these be made with gluten free flour? Can you use oat flour? How many of these should I eat a day to see a difference in my supply? Hi, I’ve made this cookie many times and it taste so nice!!! Can we make this gluten free? How much almond flour I have to substitute it? This recipe is awesome! I added chopped walnuts and they tasted great! I personally had to bake them a little bit longer, about 16 minutes but it probably just depends on your oven. I’m due in a couple of weeks so I made a batch of about 10, tried a couple and put the rest in the freezer to have ready to throw in my hospital bag when the time comes! And the rest of the dough is in the freezer as well. If you freeze them, do you have to thaw prior to baking? Or do you bake frozen? I’ve made these several times and had good results at baking them from frozen. Just have to keep a close eye on them until the edges are just brown. In my small oven it’s usually 12 min at 350. I just made a batch of dough to freeze and take to a friend with a 2 week old. How many should you eat to see results? I haven’t made these yet and would like to although cannot find a new Brewers yeast can I substitute this for another type of yeast? I was about to buy already made lactation cookies when I thought, why don’t I just make them myself? This recipe sounds amazing! Interested to know if anyone has used honey instead of sugar? I use honey when I make muffins, but I’m not a cookie maker so I’m unsure what the consistency would be like. These cookies really work! I had to eat a few a day.. Who doesnt love cookies lol I was over producing for like 24 hour.. Lol my breast were full all the time I felt like! Making another batch and going to power pump! Thank you! Has anyone put the dough in the fridge to firm up overnight before baking? Ohhhhh my gooooooodness! These are SO DELICIOUS! To be honest, I was kind of hoping they wouldn’t be so I wouldn’t be addicted to them. I made a batch and I have to completely watch myself. 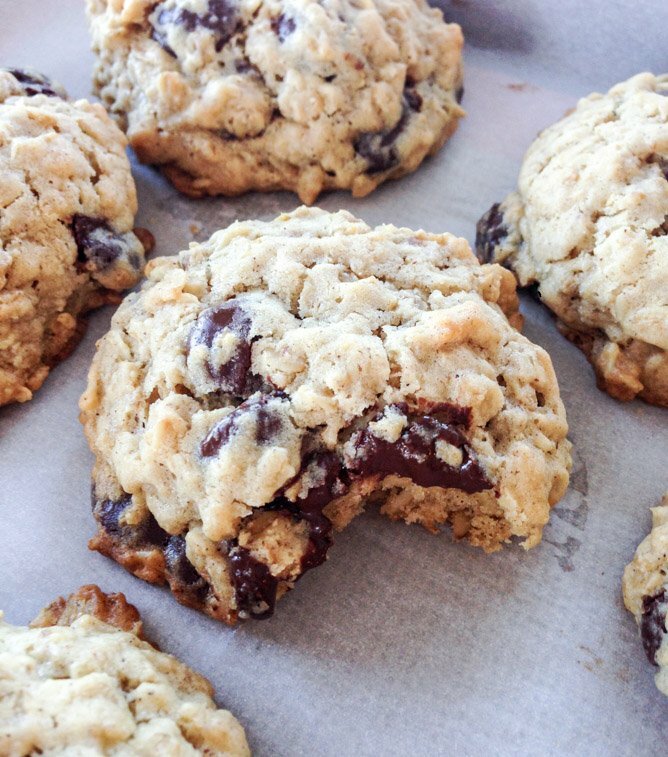 These are better than the regular oatmeal chocolate chip cookies I make! The only difference on this recipe was I used coconut sugar instead. I’ll be baking up a batch for my friend when I visit her new baby next month. Thank you for sharing this recipe with us!